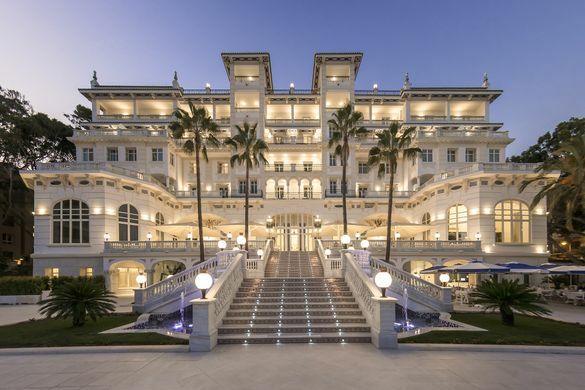 27 November 2018: To celebrate the festive season, Malaga’s grand luxury hotel, Gran Hotel Miramar, is drawing its guests into contemporary winter reverie with luxurious epicurean delights. The hotel offers a spectacular backdrop, decked out in its Christmas and New Year finery, for the array of festive feasts on offer, all showcasing exceptional local cuisine, the finest Andalucían ingredients and ancient festive traditions for a warm and hearty celebration. Perfect as a base to explore Malaga and enjoy the unique festive atmosphere in the city, Gran Hotel Miramar is situated just five minutes’ walk from the city centre. Visitors can expect special celebrations from November through to January including seasonal concerts, carol services and Christmas bazaars perfect for picking up gifts, holiday baskets and a host of other items. Not to miss is the stunning Christmas light display and show in the city’s famous Calle Larios which kicks off with a huge street party on 30 November – one of the most talked-about attractions in Europe. Forming the backbone of Christmas traditions in Andalucía are the belenes, or live nativity scenes, where many townsfolk dress up and use the town’s streets, houses and plazas as their stage. Visitors can follow a special route through Malaga to see many of the scenes. On 28 December, the city celebrates its annual Verdiales Festival. This traditional music and dance contest, an intrinsic part of Christmas in Malaga, sees performances from over 30 competitors, also known as ‘pandas’, from the local mountain villages. Festivities in Spain traditionally kick off on Noche Buena (Christmas Eve), with an elaborate family feast of regional dishes using the best local ingredients. In Andalucía, expect consommé with sherry from Jerez; gambas from the sea that cradles the south of the region; and jamón from the black pigs reared in Huelva. For guests at Gran Hotel Miramar meanwhile, last-minute Christmas shopping or sightseeing in the art and cultural capital of Spain is the perfect prelude to a classic five-course festive menu at fine-dining establishment, Príncipe de Asturias. The enticing culinary experience created by executive Chef Diego Nicás and his talented team includes fresh crab meat terrine, seaweed caviar and sea asparagus; royal salmon salad, shrimps and fennel carpaccio; aniseed rock fish bisque with lobster medallions; and Christmas capon with dried apricots and pistachios, and all the trimmings. 24 December 2018. Price €150 per person, including wine pairing selection. The perfect toast to New Year, a magnificent five-course menu influenced by Malaga’s regional specialities also offers refined wine pairings selected carefully for each dish. Starting with curated cocktails served alongside fresh Mediterranean oysters, prestigious Iberian meats from the mountains and local cheeses, guests can then enjoy an exclusive menu of lobster and crayfish Royale, mirepoix of rockfish, cockles and razor clams; black sea bass with dill gnocchi and marine smoothie; beef tournedos, potato mille-feuille and pumpkin turbant with white truffle sauce; all finished with a 24 carat gold dessert. 31 December 2018. Price €360 per person, including wine pairing selection. In the incomparable setting of the Mediterráneo Restaurant, looking across to the Mediterranean Sea, guests can enjoy a Swing Brunch on Christmas and News Year’ Day with an exquisite selection of traditional sweet and savoury delights. Live cooking stations will feature typical regional seasonal favourites such as tapas and ceviche, Iberian meats and international cheeses, and fresh seafood brought in that morning from the Mediterranean. Rounding off celebrations, an assortment of delectable treats from the province of Malaga delight including Borrachuelos (referred to as ‘drunken cookies’ due to the wine in the dough, they are filled with a sweet filling and covered in honey); Roscos de vino (made with sweet wine, the crumbly cookie is covered in a sugar glaze); and one of Spain’s most famous sweets – Turrón (a bar of nougat and almonds, often featuring interesting new flavours such as gin and tonic, bubblegum and blackberry). Live music entertainment will create a charming setting pairing musical rhythms and exquisite cuisine for a leisurely, glamorous brunch. 25 December 2018 and 1 January 2019. Price €130 per person, including wine pairing selection. Gran Hotel Miramar Festive Menu available here. Rooms at Gran Hotel Miramar start from €236 per night including breakfast, excluding tax and service. For further information visit www.granhotelmiramarmalaga.com/en/or call +34 952 603 000.